Most families read their bedtime stories such as Cinderella and Snow White and the Seven Dwarfs to their children. Well, my family is a little different. Instead, my family read the tales of tyrant kings who chop off the heads of their wives, heroes who fight wondrous ancient creatures to reclaim their family throne, and pirates who fight injustice. These stories influenced my life and the person I am more than I can say. As a curator-in-training, my current and most difficult task is picking my focus. First it was Ancient Egypt, then the Celts, Ancient Britain, Ancient Rome and Greece, Pirates and Maritime history, and finally Tudor-Era England. I cycled through these topics constantly and never understood the method of my madness. Then one day, it hit me. I realized the connection between all of these subjects narrow down to one group: intelligent women. Hatshepsut, Queen Medb, Boudica, Athena, Artemis, Anne Bonny, Grace O’Malley…these women inspire me, for in male-dominated societies they stood up for themselves and said, “I can do that!” These women shined like bright beacons before dawn. Men and women alike felt drawn to them because they offered more than the average. Their presence in the world marked history. Anne Boleyn and Henry VIII hold special places in my heart, for their lives shared great love and pain. 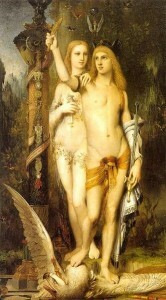 When reading about their lives, I find myself drifting to a similar tale from Greek Mythology, that of Medea and Jason. Separated by history and mythology, the lives of Anne and Medea have surprising parallels. Both women in worlds run by men, educated, and highly intelligent. Their courage and duality inspired change and elevated the men they loved to new levels. These women have controversial identities that historians debate even today. The world sees them as both heroes and villains because of their dual natures. We learn from them how to accept that responsibility and the consequences for the power we use. While to our readers, the story of Henry VIII and Anne Boleyn is better known; the story of Jason and Medea may not. The tragic tale began with the Quest for the Golden Fleece. Born the son of King Aeson of Iolcus, Jason found himself on a quest to avenge his father’s murder and reclaim his throne after the coo of his uncle Pelias. Jason and the Argonauts faced many perils but finally arrived in the barbarian land of Colchis. Here, King Aeetes agreed to give Jason the fleece if he performed 3 tasks: 1. To plow a field with fire-breathing oxen; 2. To sow the teeth of a dragon in that field; 3. To defeat the warriors grown from those teeth. Medea, the daughter of King Aeetes, agreed to help Jason with agreement that once completed he would marry her and take her with him. Medea fell desperately in love with Jason, which many writers attributed to the influence of the goddess Aphrodite. With Medea’s help, Jason successfully completed these tasks. As a guardian of the Golden Fleece, Medea betrayed her family and people by providing Jason with ointments, potions, and knowledge to seize the Golden Fleece. As they escaped, she killed her brother Apsyrtus in order to distract her father from pursuit. Returning to Iolcus proved treacherous as well, passing Sirens and the bronze man Talos and only surviving again with the cleverness of Medea. Upon arrival in Iolcus, Jason discovered that King Pelias had no intentions of giving back the throne. In an attempt to help Jason again, Medea tricked the daughters of Pelias into killing the King by demonstrating a spell that turned a sheep into a lamb thus restoring its youth. Unfortunately for Pelias, Medea failed to complete the spell thus sealing his fate. For this trickery and the murder of the king, Pelias’ son Acastus exiled Jason and Medea to Corinth. With no allies to turn to, Jason and Medea had no choice but to comply. In Corinth, they quickly settled down and began raising two sons. Soon Jason’s reputation as a hero and slayer of monsters reached the ears of King Creon who proposed Jason marry his daughter, Princess Creusa, thereby becoming heir to his throne. How could Jason refuse? Medea confronted Jason about his engagement, reminding him of the sacrifices she made for him and their new family. Jason ignored her, accrediting his success in capturing the Golden Fleece to the goddess Aphrodite and not Medea. He rejected their marriage in favor of a royal one. Infuriated by his actions and the breaking of their vows, Medea plotted her revenge. She gave a poisoned dress as a wedding gift to Princess Creusa. The poison quickly killed the Princess and the King who tried to rescue her. To complete her revenge and make amends for the betrayal of her family, Medea turned the knife on their own children. She killed her two sons fathered by Jason, leaving him alone with no heirs to his legacy and no princess to marry. Medea fled to Athens on the chariot of the Sun-god Helios. Ancient Greek and Roman societies viewed men and women as opposites. Men are strong, women weak; men are smart, women naïve; men are contained, women emotional. These views created an image of male superiority and female inferiority that would last for centuries. Greek sophist Gorgias defined the virtues of proper women. “If you want a definition of female virtue, it is not difficult to provide; it is that she must run the household well, preserve what contains and what belongs to her husband.”1 Her honor and reputation depended upon chastity and virtue. Society knew her only for these qualities and not as a source of gossip. Considered the property of her husband, her purpose in life was to conceive and bare heirs. Failure to produce heirs was a crime punishable by divorce and public shame. These virtues hold true to 16th century Tudor England. At court, her reputation could make or break her family. “The wealth, power and prestige which success at court could bring attracted countless young men and women to attempt their fortunes here. But the price was their integrity, their morality, their health, their spiritual safety and their self-respect.”2 It was a dog eat dog world where wealth and honor were made and taken away within a week as the whims of the king waxed and waned. These whims applied to women as well. Married to suitors for her dowry and family connections, she was little more than a cow to be traded for, desired only for her milk and the calves she would bear. Indeed, the virtues of a male courtier dictated that “if a female relative is attractive, then sell her for a good price to ‘thy better.”3 And sell her he did. Her purpose and function was to aid the advancement of the family through marriage. Once married her duty was to conceive and bare heirs to continue the male line of her husband. Medea and Anne Boleyn lived by these virtues, but offered something more. Both highly educated, their personalities and intelligence gave them an edge that attracted women and men alike. Like Medea, Anne had a thirst for knowledge and a reputation for observation. “Captivating to men, Anne was also sharp, assertive, subtle, calculating, vindictive, a power dresser and a power player, perhaps a figure to be more admired than liked.”5 Her education in foreign courts made her more valuable to her father. Thomas Boleyn, had a great many plans for his family advancement and maneuvered his children like pawns on a chessboard. Without this education, she would not have survived at the English Court or won the heart of a King. Anne was educated in the courts of the Netherlands while serving Archduchess Margaret of Austria and then France to Queen Claude. “The elite of Europe vied to place their offspring as attendants on her [Margaret of Austria] and her charges in the knowledge that they would effectively be educated alongside Europe’s rulers of the next generation. Nowhere could a father find a better start for a future courtier.”6 Education in the French court proved inspiring to the daughter of a diplomat. The exposure of poetry, literature, and new religious ideas swept the country. Little is written of Medea’s education, but nevertheless her resulting knowledge of the earth and elements beyond any other. Roman playwright Seneca suggested that her knowledge was so vast that she created Greek fire to burn the city as a result of Jason’s betrayal. “The city’ll burn next we fear…water fuels the flames. Uncannily, the fire burns fiercer when we damp it down.”7 To this day, Greek fire remains only legend. Modern scientists cannot replicate its power. Medea fell in love with Jason and agreed to help him (at his request) retrieve the Golden Fleece under the terms that once accomplished they would marry. By agreeing to help Jason, Medea also agreed to betray her people and her family thus changing her life forever. Be fooled by ignorance of the truth, but love. To legitimize any children he had with Anne, he would need a divorce from Katherine in order to marry again. But the long struggle with Rome would not permit this separation and ultimately forced Henry to make monumental decisions. Henry argued that a divorce be degreed on the grounds that 1.) Katherine consummated her marriage to Henry’s brother Arthur and according to Leviticus “if a man shall take his brother’s wife, it is an unclean thing: he hath uncovered his brother’s nakedness.”11 2.) the punishment for an unclean marriage resulted in a childless marriage and in this case sonless 3.) the papal dispensation from Rome contained errors. The arguments between the Catholic Church and Henry’s legal team went round and round in a circle making no progress. On top of this, the English bishops were siding with a stubborn Queen Katherine who used her popularity with the people and remained true to her statement that the arguments brought forth were false. “The King had made up his mind that their marriage was against the law of God, and she, by reiterating her complaints, was simply driving him mad with irritation.”12 Henry’s patience on the matter was running out. Anne “had a genuine interest in religion, the kind of reforming religion rapidly becoming fashionable on the continent following Luther as a reaction to the obvious failures and corruptions of the clergy.”13 In private she brought Henry condemned books and pamphlets on evils of the Catholic Church and the cry for reform. Specifically it is thought that she gave him A Supplication of the Beggars by Simon Fish and The Obedience of a Christian Man by William Tyndale both supported the power of the king over the Pope. Their influence and Anne’s encouragement inspired Henry VIII to ultimately break his allegiance with Rome becoming the head of the Church of England. As head of the Church of England, he declared his marriage to Katherine null and void allowing him to marry Anne. Likewise, having successfully captured the Golden Fleece with the help of Medea they could go to Iolcus and claim his throne. Unfortunately, this achievement was just the beginning of further battles the couples would tackle. Euripides praised Medea as a good wife, “benefiting Jason with compliance in all things—indeed, this is the greatest safeguard, when a wife does not stand separate from her husband’s side.”14 But perhaps Jason felt threatened by Medea, after all he owed his achievement to her. The behavior of Jason demonstrated Medea’s authority and dominance. He approached her in the middle of the play stating, “I’ve come at your command.”16 Medea’s personality and attitude commanded attention. This does not match the ideas of the time regarding marriage. Men were to dominate and women supplicate. Likewise, Henry expected Anne to assume a position of supplication in her knew role as queen and wife. Instead, Anne continued as she had for the past seven years, actively assisting with the Reformation. Men expected to participate in politics where women remained secluded at home, so Anne’s continued involvement in the state of the kingdom. “Spitfire as she could be Anne Boleyn was also uninhibited and demonstrative.”17 Henry valued the unique qualities Anne had until they became taxing. Her role was to have a son, not to interfere with politics and religion. She possessed characteristics intriguing to men, but not suitable in a wife. Anne’s dual nature and “sharp tongue”18 would not allow her to be dominated by Henry once married. She pushed back and “was getting prouder and bolder all the time: she was using language to him that the Queen [Katherine] had never used in her life.”19 She was not acting like the respectful wife Henry thought she would. She was stepping more and more into the male realm, a place he would not allow her to stay. The question of the legitmacy of the marriages of Henry VIII and Anne Boleyn and that of Jason and Medea eventually came into play. Both married by choice rather than an arranged marriage, almost unheard of during these times. This raised questions about the legitimacy and acceptance of their marriages. According to Athenian standards, the marriage of Jason and Medea lacked 1.) an agreement between the families, 2.) a procession from the former home of the bride to that of her husband, 3.) celebration of the family. In other words, their families did not support the marriage. Similarly, the marriage of Henry VIII and Anne Boleyn was not supported but on a much larger scale. The separation from Rome made it difficult to continue foreign relations. Rome finally decreed the marriage to Katherine of Aragon to be legitimate and excommunicated Henry for his refusal to return to that marriage. The large population of the English people did not back Henry’s marriage to Anne. People did not look up to Anne believing that she manipulated and bewitched the King. In the case of Henry VIII a son was required of his wife and Queen. Without a son, the legacy of the Tudors would fall and everything they had worked for would be in vain. Without the support of the English people and her favor with Henry decreasing, Anne’s final hope was to provide a male heir to the throne. After three years of marriage and many miscarriages, her final miscarriage revealed a child with the appearance of a boy. This convinced Henry that again God was punishing him yet again, and that it must be dealt with immediately. As a priestess, Medea knew the power of words and the gods. Her outrage directed at Jason is plausible. Jason broke his vows to Medea for a younger woman of better social standing. After all she had sacrificed; these actions told Medea that she was no longer any value or use. Likewise, Anne found Henry’s eye had wondered as a result of her miscarriages. Jane Seymour was now favored and actions were in motion to remove Anne permanently. After all that Medea and Anne did for Jason and Henry, they found their marriage vows broken and their husbands in the arms of a younger woman. Henry’s reign was that of a personal monarchy. Henry made all decisions regarding the kingdom but was influenced by those who had his ear on specific matters. Henry’s break with Rome and separation from Katherine was not accepted by public opinion. The kingdom was against his marriage to Anne Boleyn. Medea’s knowledge of spells and herbs often reduces her position to that of an evil witch or sorceress. There is no evidence against this claim, so we accept it. However, I always like to keep in mind that knowledgeable women were often condemned for their intelligence as it scared many people. Knowledge is power, and power requires responsibility. Fear too has power, fear of the unknown and unnatural. Intelligent women during the time period of both Medea and Anne were rare. The price of intelligence and education is the price for being accused of other worldly knowledge. For what could be more natural to call a smart and confident woman than a witch? “Much later the King would be said to explain it all away by reference to sorcery: he had been bewitched by Anne Boleyn.”25 Anne Boleyn was accused of bewitching and manipulating Henry VIII in order to become queen. This made her a servant of the devil, of which she must have been marked as. However, there are just as many reports describing Anne’s beauty. Simon Grynee described her as “young and good-looking”28 and to Lancelot de Carless she was “beautiful and with an elegant figure.”29 Opinions regarding Anne’s appearance vary and perhaps that has something to do with the standard of beauty of the time. Consistent reports tell us she had a dark complexion (skin, hair, and eyes) where those acclaimed for their beauty had a fair complexion. In the pursuit to marry Henry VIII she both makes and breaks herself. Her encouragement to remove Katherine from power sealed her own fate as it gave Henry the realization of power. Henry VIII was now Head of the Church of England and could do as he pleased with no consequences. The chaos that swept the English countryside would not have ensued had public opinion been in favor of the match. An important fact to note is that Medea is not Greek, but Greeks wrote the texts and stories that exist about her. According to Greek tradition, anyone not Greek is considered a barbarian. “The playwright has thus developed a core attribute of Medea’s mythological persona—her status as outsider—by locating her origins at the far (and hazy) limits of the Greek world.”31 Likewise, Anne can also be seen as an outsider as is not of royal blood and therefore not legitimate or accepted over Queen Katherine. Yet the plays of both Euripides and Seneca showed sympathy for Medea. We as the audience agree that what Jason has done deserves punishment. Likewise the people of England felt sympathy for the final verdict an execution of Anne. The charges against her were clearly outrageous, but what could they do? Interpretations of the lives of these two remarkable women spark such controversy. In truth, the persona of these ladies shows them as either victim or villain. Viewed as heroines for asserting their rights and beliefs, but also condemned for doing so. Without the aid of primary sources explaining the motives and actions of these individuals, we cannot be sure what their intent and purpose was. Their actions spark controversy and further questions that we may never know the answers to. Differences between Greek playwright Euripides and Roman playwright Seneca raise further questions about Jason and Medea. Euripides portrayed her as incredibly emotional, but in control of her actions. “Be gone, be gone! I am no longer capable of looking at you now that evil conquers me. I understand the evil I’m about to do, and yet my raging heart is stronger than my plans—the heart which causes mortal kind the greatest evils.”33 Her actions are purposeful and without remorse. Her children die out of revenge. Roman playwright Seneca showed Medea as a victim. She reacts as if driven by a force not her own. She constantly refers to the voices in her head speaking evil things and causing her to behave so vilely. “Don’t say that, please, oh please, raging voices of my pain.”34 Seneca indicated that the murder of Jason’s sons was not for revenge, but to save them from the consequences of her actions. Also in this version, Seneca explored Jason’s point of view. “Seneca’s Jason is aware of this moral dilemma, aware that he is not treating Medea rightly; the only self-justification he offers is that love for his children, not fear for his life, makes him abandon Medea.”35 Henry likewise had a moral dilemma in regards to Elizabeth. Jason talked King Creon out of executing Medea. “So there is some reason to credit Jason’s claim that only his intercession saved her life.”36 Could Henry have somehow done the same by executing Anne? Could her death have ultimately saved her a life of disappear and further rejection? Love letters between Henry VIII and Anne Boleyn do exist (seventeen total) and shed some light on the beginning of their passionate affair. “Indeed, their very existence is a proof of passion, since the King greatly disliked writing letters and very few other handwritten letters of his have survived with the exception of brief notes to Wolsey.”37 Still, these letters reflected Henry’s passion and devotion, but what of Anne’s? Anne Boleyn too is seen as both a villain and victim. Texts and media seem to portray Anne in two ways: 1.) the intelligent woman in love with the King of England hoping to help share a vision of a new spiritual awakening and 2). the intelligent woman who manipulated her way to the throne for personal advantage and revenge. We all have our version of Anne Boleyn and will never know for certain, but her actions remain. The lives of Anne Boleyn and Medea run parallel to one another. Intelligence in a world dominated by man and male thought raised their status among women and ultimately led to their downfall. Both highly educated and acclaimed for their intelligence. Both supported and helped their husbands achieve new social levels. Both accused of poisoning their royal rivals, Katherine of Aragon and Princess Creusa. Both had brothers who suffered death because of their actions. Both suffered alone the results of broken marriage vows for a younger woman. Both condemned as witches. Both controversial figures that intrigue us to this day. Their lives and actions bring forth new questions. Did Anne Boleyn love Henry VIII and he her? Did she use the power he gave her for personal gain? Did Henry VIII use her? Questions regarding their true feelings and motives make them controversial characters. Ultimately these questions are irrelevant as the actions and decisions they made had consequences one way or another. Acceptances of their actions raise our heroines to new levels. Anne receives sympathy and later recognized as a martyr for the reformation and Medea a goddess raised to the heavens by the chariot of Helio. History and pop culture often remind us that with great power comes great responsibility. I admire these women for accepting their responsibility to stand up for women, but also accept the consequences. We’ve come a long way. The road is paved with the sacrifices of our female ancestors and we can go anywhere. We decide where we go from here. It is in Anne’s honor that I wear her portrait every day. It serves as a reminder that I alone am responsible for the choices I make. Robinowitz, and Bella Zweig. New York: Routledge, 1999. Fraser, Antonia. The Wives of Henry VIII. Vintage Books A Division of Random House, Inc.: New York, 1992. Ives, Eric. The Life and Death of Anne Boleyn. Blackwell Publishing, 2005. Lefkowitz, Mary R. and Maureen B. Fant. Women’s Life in Greece and Rome. Baltimore: The John Hopkins University Press, 1992. Ovid. Metamorphoses. Trans. Rolfe Humphries. Indiana University Press: Bloomington and London, 1968. Seneca. Medea. Trans. Frederick Ahl. Ithaca and London: Cornell University Press, 1986. Wow. This is well done. Thanks for sharing. Mrs. Evans, Your analysis is quite brilliant but hints at a distinct female bias. However I was intrigued by your viewpoint.